Just accept it as the warm holiday greeting it's intended to be, and don't judge me for dressing up my dog. He only wore this once, I swear! Happy holidays to you & yours. Hee hee, what a good dog! Merry Christmas, Santa Ziggy!!! HO HO HO! Merry Christmas, Kandi! 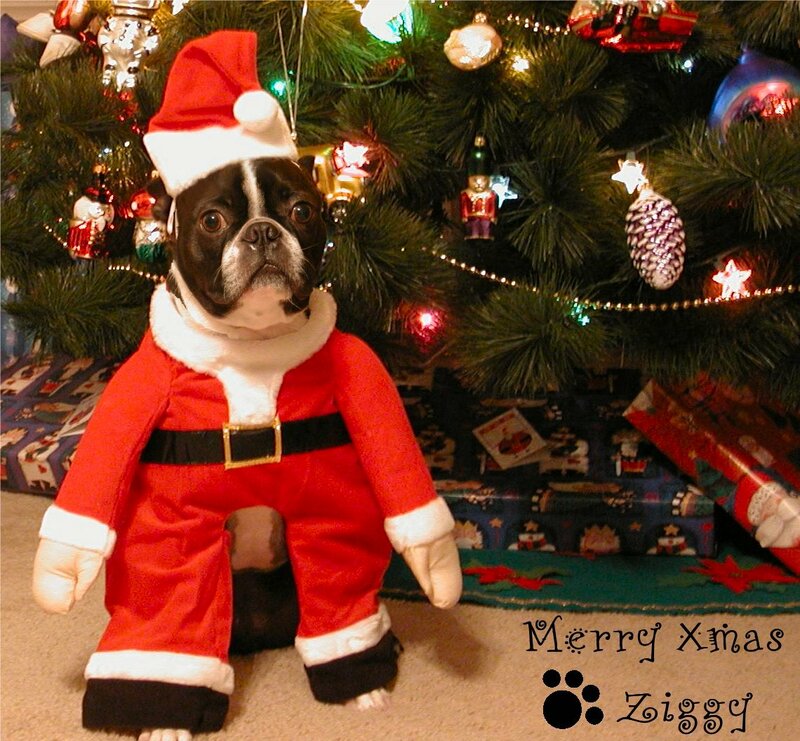 And please tell your beautiful girls that Santa Ziggy wishes them a very merry Christmas, as well! Yes, you only dressed him up once, but every time you use this photo a little bit of him dies of humiliation. Poor, poor, Ziggy. He deserves a big ol’chunk of meat for this. Call it copy right fee!! I think you’re thinking of royalties, and he already eats like a king. He is one spoiled little Santa pup! Just look at that handsome dog! He makes an awesome Santa and a perfect Christmas greeting! He is the perfect picture of unconditional love that our Savior bought to us this season. I know that feeling. After we took this photo of Zig, we laughed until we almost cried. He looks paralyzed with fear (or regret?). That look on his face says “please kill me before my friends see this.” He was such a good sport for wearing it as long as he did, which was about 45 seconds. Good thing I had the camera ready. My sister has border collies (sister #4). She had two, but her beloved Pistol recently passed away. He was gorgeous and a rescue dog, so he was our hero. Such a beautiful breed. PS – found the photo of your dogs in their hats and antlers. Very cute. Very, very cute. hahaha I wish I would have dressed my pup up as Santa. Ziggy is too cute! I’m sure this will enrage those who think it’s wrong to dress up a dog, but now’s the time to order a doggie Santa costume. Gotta’ get those post-holiday discounts. Ha! The Complete Package told me there was a special place in hell for people who dress up their dogs. He said it in the 45 second window between the time the costume went on, the photo was snapped, and the costume was shrugged off. It was over before you could put your finger aside of your nose, and up the chimney arose. Or something like that.